improve system maintenance, and are innovatively designed, with standard sizes. 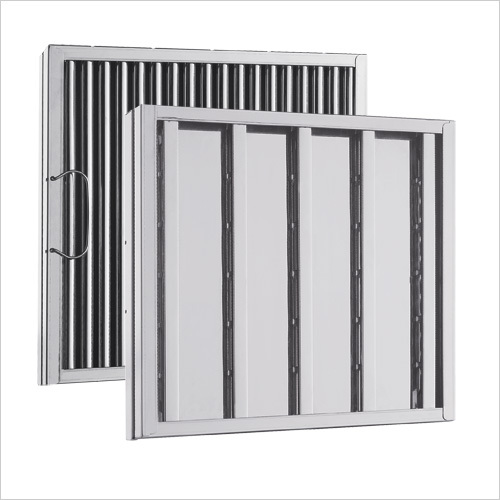 The Captrate® Solo Filter is a single-stage filter featuring a unique S-Baffle design in conjunction with a slotted rear baffle design, to deliver exceptional filtration efficiency of single-stage devices. The Captrate® Solo Filters are available in standard industry sizes, and are designed to capture and remove a high percentage of the total grease particle emissions produced during commercial kitchen cooking operations. Single unit assembly design does not require any components to be separated for cleaning and maintenance. Simply wash using a dishwasher or soak using a commercial degreaser. Copyright © 2008 GreaseMaster.Com. All Rights Reserved.